Don't turn into a head case this summer. Corral unruly locks with an easy do-it-yourself headband, courtesy of Lizz Wasserman, the design brains behind the brilliantly eclectic Popomomo eco-fashion label. "I'm totally anti-preppy/girly headbands," Wasserman tells us. "Maybe because they are impossible with curly hair, but I wanted something that was somewhere between a hat and a headband this summer." 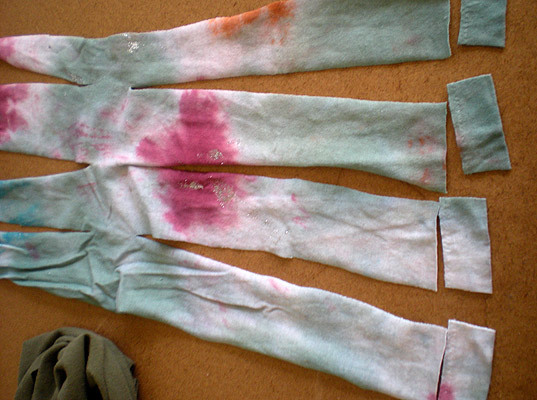 Bonus: Her recycled headband, made from two worn-out T-shirts, can be a waist-cinching belt. Take one-half of each shirt and fold it in half. You’ll be making three cuts on each piece. Starting at the center of the unfolded end, cut toward the folded end. Stop a bit before the end of the shirt. Next, make the same cut equidistantly on either side, never cutting through the fold. Repeat on the other piece. With the remaining two pieces, you’ll do the same thing, except you’ll complete the cut through the fold. Each piece will now be four strips. (Let’s call these “free strips.”) Put these to the side till later. 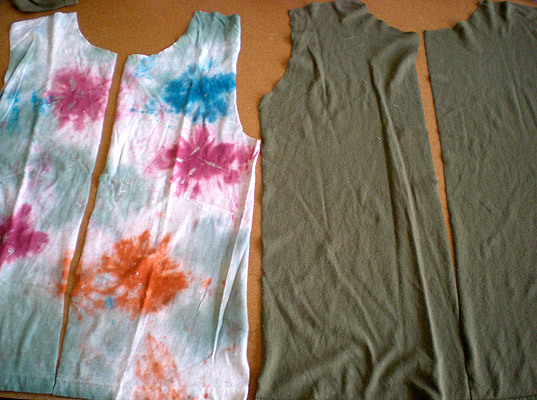 Cut off the hem-part of the shirt from all the pieces. Take the first two pieces and spread them out, one on top of the other. Make sure you can see all the pieces and that you’ve alternated them like in the picture. You’ll be doing an eight-piece braid, starting on the side where the strips meet in the middle and moving away from the center. Don’t be intimidated! 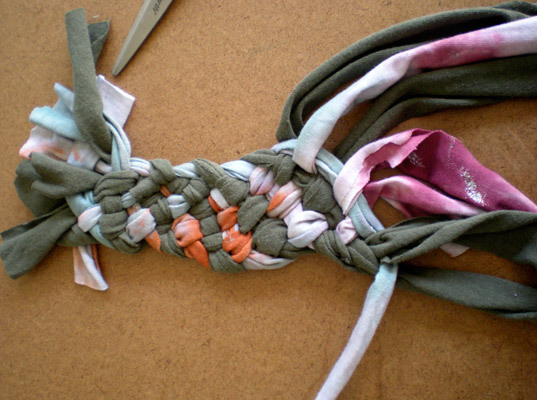 Braiding is simple weaving, so start by taking the bottom piece that is furthest to the right and weave it over the top piece next to it, under the bottom piece after that, over the top piece again, and so on. 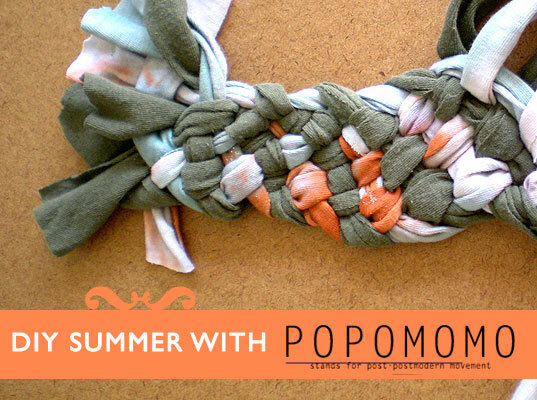 Don’t pull super-tight, but at the same time, keep the braided pieces close together. It’s better to start off looser and then pull to tighten when you get to the end of the row. When you have woven this piece through all the other pieces, start over with the piece furthest to the right. And keep going. When you reach the end of the weaving/braiding on the first side, (when the strips are too short to keep going), start on the other side. When you switch sides, take the scissors and cut the fabric that was connecting all the strips on that side, so you have free pieces again. Start to braid as you did before. When you again reach the end: you’ll tie off the pieces. 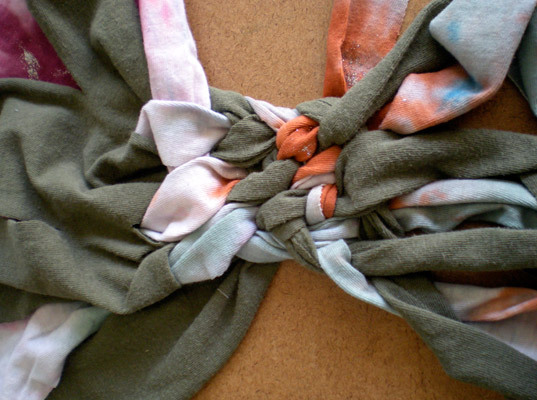 Just take two of the strips and double-knot them together, repeating until all the pieces on one side have been knotted to at least one other piece. Do this on both sides of your braid. Get the free strips from before. 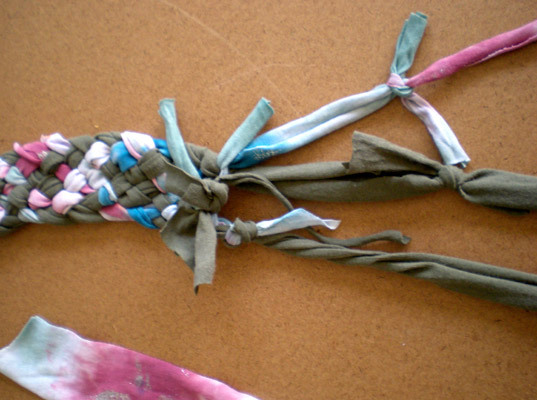 From the tied off ends: pick the three longest pieces on one side of the braid. 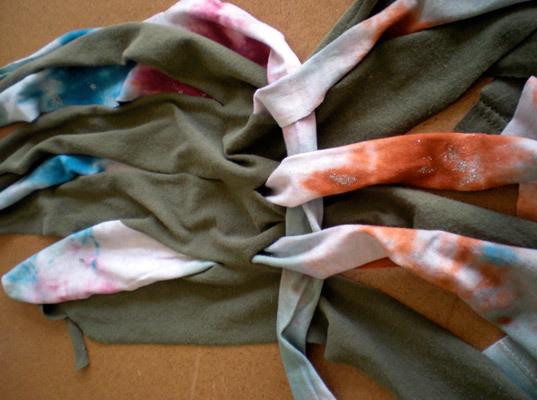 Tie one free strip to each longest end. 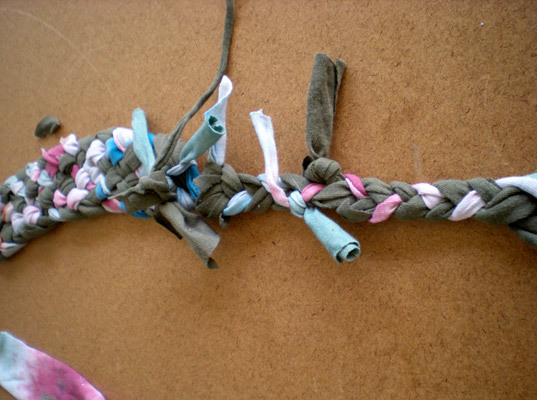 Then, braid these three, new, longest pieces together. When you have about 3-4 inches left of the strips to braid, tie them off like before. 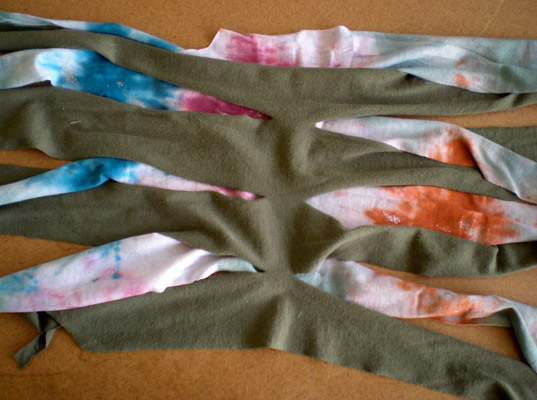 Take each of the three tied off ends and cut them into thinner pieces, about three strips per original strip. Pull the new thinner pieces. Now you have nice, dangling ends. Repeat these steps on the other side. 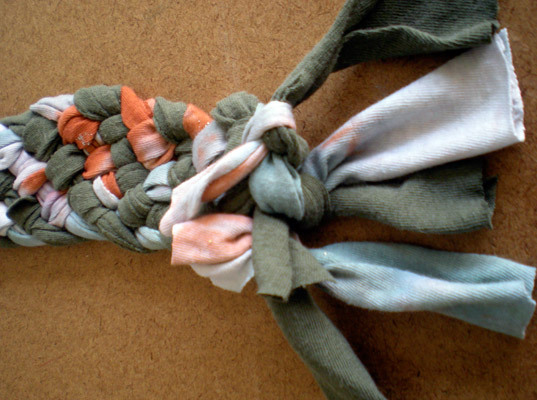 Next, take a look at your headband and tuck in all the pieces that are sticking out from where you tied them off. If they are long, weave them in and out until you’ve used them up. If they’re short, just tucking them in should be fine. 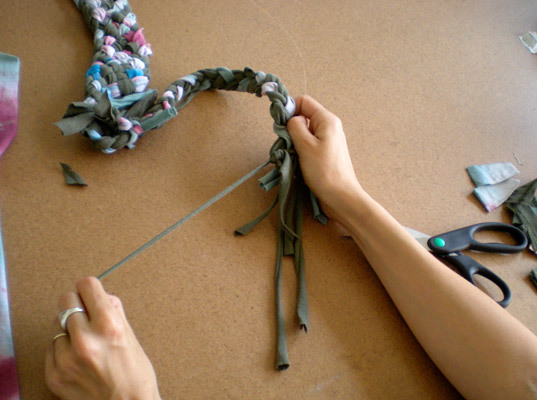 Add beads to the end of the braid. Alternatively, you can cut additional straps from the backs of the tees to repeat the three-piece braid twice and make a long belt. 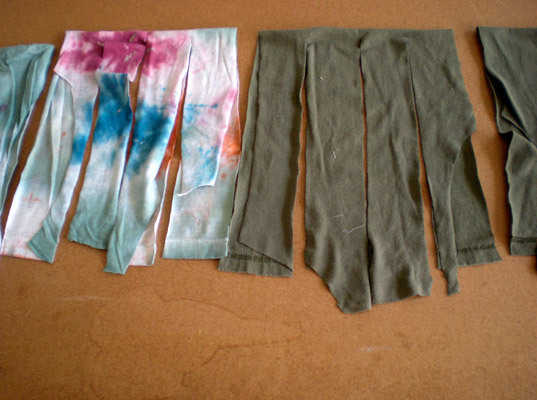 Take one-half of each shirt and fold it in half. You'll be making three cuts on each piece. With the remaining two pieces, you'll do the same thing, except you'll complete the cut through the fold. Each piece will now be four strips. (Let's call these "free strips.") Put these to the side till later. Take the first two pieces and spread them out, one on top of the other. Make sure you can see all the pieces and that you've alternated them like in the picture. You'll be doing an eight-piece braid, starting on the side where the strips meet in the middle and moving away from the center. Don't be intimidated! Braiding is simple weaving, so start by taking the bottom piece that is furthest to the right and weave it over the top piece next to it, under the bottom piece after that, over the top piece again, and so on. 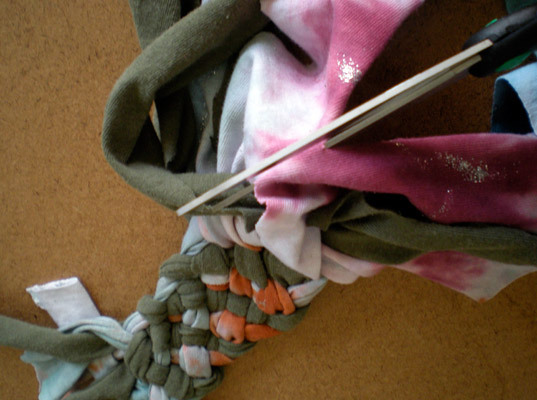 Don't pull super-tight, but at the same time, keep the braided pieces close together. It's better to start off looser and then pull to tighten when you get to the end of the row. When you again reach the end: you'll tie off the pieces. 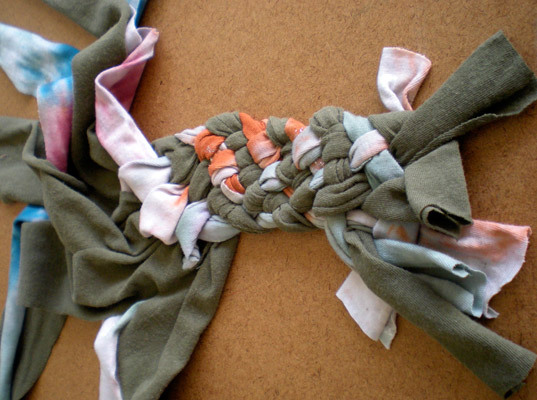 Just take two of the strips and double-knot them together, repeating until all the pieces on one side have been knotted to at least one other piece.